Home › FAQ › What SAT Prep Courses Are Available? Whether a student is seeking admission into a prestigious college or hoping to win a competitive scholarship, discovering what SAT prep courses that are available to them can significantly boost their SAT score and increase their chances of getting into their top pick school. Understanding how to pick the right course and knowing what options are available are the best ways to find the perfect course for every individual. According to the US News and World Report, one of the most important factors when choosing a prep course is the level of student support offered by the course and what support the student needs. A course should give multiple methods of communication for the student to stay in contact with an instructor or tutor; live chats are an especially useful communication tool. Another important factor is how the material is delivered. The best delivery method varies from student to student, so finding one that suits the student’s learning style is ideal. An ample amount of available practice tests should also be available for students to prepare for the SAT. Students should also review the different type of learning materials available through each course and make an individual decision on which learning materials are most effective for their learning style. Blogs, flash cards and tutorials can all be important tools to learn the material and prepare for the test. Price point can also be an important factor, and both students and parents should consider the investment and the payoff. 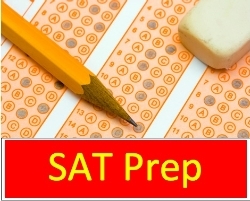 There are a number of SAT prep courses available online that also offer on-site classes. Some of the top online sites that offer SAT prep courses are Princeton Review and Kaplan, both of which come with a high price tag, but promise live instruction and performance guarantees. Students can choose between in-person or fully online courses, and they receive ample SAT practice tests. An Internet search will reveal various other prep courses available online. Another option for students seeking to take an SAT prep course is to check with high schools in the area that might offer classes geared towards test-taking strategies, an important part of SAT test prep. One of the leaders in free online classes is Khan Academy, an online resource that partners with a variety of organizations including MIT and the Museum of Modern Art to teach various subjects. The SAT prep course that is available through Khan Academy is a great resource for students on a budget. Students are able to move through the practice tutorials at their own pace and refresh their skills in either math or reading and writing. Khan Academy also offers full-length SAT practice tests for students to download and get a feel for the testing style. Another excellent resource is Tutor.com, which is a website that offers live tutors to chat with students about various topics. It’s not free to join, but many libraries are paying members, thus library card holders can access the site for free. And be sure to check out public libraries and other local resources for free or inexpensive classes. They may not be as in-depth, but the price is ideal students on a budget. Standardized testing can be nerve-wracking, so it’s no wonder why so many SAT prep courses are available. By assessing the student’s needs and comparing them with the various SAT prep courses that are available, students and parents should feel confident in selecting a course that can improve the student’s scores and help them achieve their goals.